While work is already underway on developing another farm bill, we thought it would be a good time to examine how producers in different regions have fared under the current and previous farm bills. The 2014 Farm Bill made several changes to U.S. farm programs. The most notable was probably the elimination of Direct and Counter Cycle Payment (DCP) and Average Crop Revenue Election (ACRE) programs and the development of the Agricultural Risk Coverage (ARC) and Price Loss Coverage (PLC) programs. While work is already underway on developing another farm bill, we thought it would be a good time to examine how producers in different regions have fared under the current and previous farm bills. Fixed direct payments were by far the largest source of farm program payments under the 2008 farm bill. These payments were made based on a fixed price and yield for most commodities. For example, corn producers received $0.28 per bushel on the farm’s direct payment yield on 83 to 85% of base acres. The direct payments were reduced by 20% for farms that chose to participate in the ACRE program. During the signup period for the 2014 farm bill, producers of most commodities were faced with a choice of signing up for the Agricultural Risk Coverage (ARC- with county or individual options) or the Price Loss Coverage (PLC) programs. The ARC-CO program proved to be the most popular choice for corn, soybean, and wheat producers. For instance, 93% of corn and 97% of soybean acres were enrolled in ARC-CO. In the case of wheat, PLC attracted some attention with 42% of base acres enrolled in that program (several other commodities also have significant acres enrolled in PLC). We have discussed the current program payment structure numerous times (here, here and here, for instance), so we won’t go into detail in this post. Rather, we will just reiterate that the ARC-CO program makes payments on the basis of county level yields and current market prices in relation to an Olympic Average benchmark revenue. To compare the payment rates under the programs we calculated the average direct program payments made from 2010-2013 and compared it to the payments made under the ARC/PLC programs from 2015-2016. The national level data for the programs were obtained from ERS. In aggregate, the average annual payments under the ARC/PLC program have been larger than the direct program payments. At the national level, direct program payments averaged $4.6 billion from 2010-2013. The Economic Research Service estimated nationally that the ARC/PLC program made payments of $5.2 and $7.8 billion in 2015 and 2016. ERS is expecting ARC/PLC payments to rise to $8.6 billion in 2017. However, it is worth noting that this further increase is being driven by the rapid rise of payments under the PLC program, while payments under ARC begin to decline. The decline in ARC program payments are likely to accelerate further in 2018 as the Olympic Average revenue guarantees continue to fall. Although the ARC/PLC programs have made larger payments than direct program payments at the national level, if you talk to many farmers you will soon find that payments for some producers have been relatively small. State level payments made under the ARC/PLC program were obtained from the Farm Service Agency (FSA). Because the ARC/PLC program makes payment roughly a year after the commodity is harvested, the ARC/PLC program payments cover the 2014 and 2015 crop years, but were received in 2015 and 2016 respectively. Figure 1 shows how the average payments received under the ARC/PLC program from 2015 to 2016 compare to the average payments under the direct payment program from 2010-2013 at the state level. While it would be nice to compare these values at the county level, the necessary data do not appear to be publicly available. Also keep in mind that this only compares ARC/PLC to the DCP payments, thus excluding all other types of payments. Figure 1. 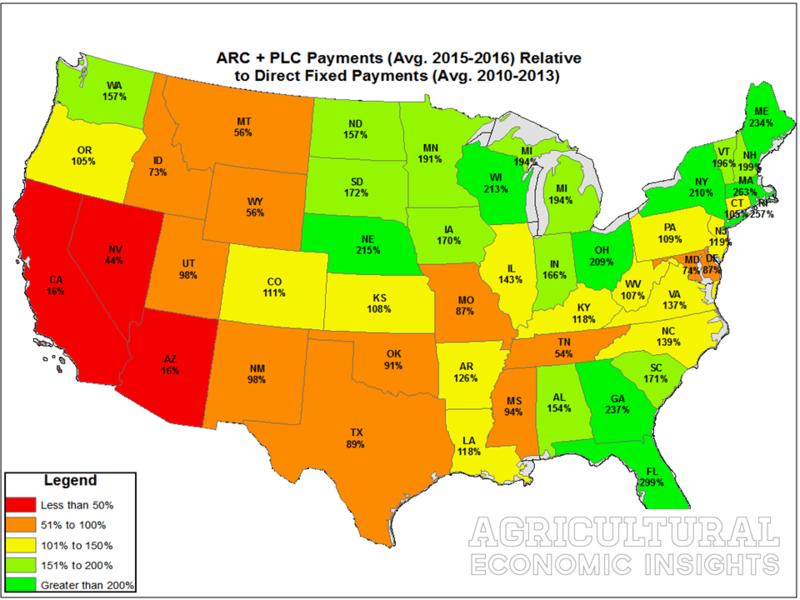 Ratio of Average ARC/PLC Payments (2015-2016) to Average Direct Fixed Payments (2010-2014) by State. Based on the map above, one can see why there are such large differences of opinion about the merits of the ARC/PLC program. In some states (those colored green) the ARC/PLC program payments have averaged at least 150% of direct program payments. In several (FL, GA, NE, OH, WI, NY, RI), the payments have averaged 200% of the direct program payments. However, one will quickly see there are many states that didn’t fare as well (those in orange and red). As one travels the country it is not hard to find mixed feelings toward the current farm bill. In some areas producers are quite happy, and in others they are very dissatisfied. While the total amount spent on ARC/PLC has exceeded that of direct program payments under the previous farm bill, the payments have been distributed differently across the country. While our analysis examined this at the state level, it is also true that the distribution can vary dramatically within states. For instance, this map from the FSA shows several counties in KS, NE, IA, MO, CO (and others) with $0 corn payment rates that border counties with payments that averaged over $70 per acre, per year of the program. Those kinds of differences tend to cause dissatisfaction among neighbors. To date, it appears that most of the states in the Corn Belt have received slightly larger payments under the ARC/PLC program than the amount that they had received from direct payments alone. In the other camp, several states throughout the Central and Western U.S. have not received as large of payments to date. It is important to note that there are a few years of payments yet to be received. One of the reasons that ERS forecasts such a dramatic rise in PLC payments is that many wheat and sorghum producers enrolled in PLC will likely receive large payments this year. This will likely help change the situation in many of the states that are shaded orange and yellow. Further, it is likely that payments under ARC will start to decline and reduce the amount by which ARC/PLC payments have exceed direct payments in those shaded yellow and green. All these and other factors are likely to shape and influence opinions about the program. As work begins on the new farm bill there are sure to be lots of differing attitudes about the current programs. It will be interesting to see how the debate unfolds. The data for state level ARC/PLC payments is from the FSA payments made for the 2014 and 2015 crop years. The data for the direct program payments is from ERS. ERS did not provide an estimate of state level ARC/PLC payments. The ERS estimates of national payments from ARC/PLC differs slightly (but in our opinion, negligibly) from FSA’s reported payments.